According to a Wikileaks cable, Ambassador Gennady Tarasov, the U.N. high-level Coordinator overseeing the issue of the missing archives, noted in 2009 that the Iraqi search was hindered by "the lack of a GOK [Government of Kuwait] inventory or description of what the missing archives look like." Back in 2000, Kuwait actually did provide this 2-page list that purported to describe the type and volume of the missing archives. Kuwait should nevertheless update this list given that documents have been returned in the interim (see 2 and 4 below). As further support, Security Council Resolution 687 required the Secretary-General to report on "a list of any property that Kuwait claims has not been returned by Iraq" (emphasis mine). As in other cases of displaced government records, there may be a disincentive for Kuwait to describe the missing archives in too much detail lest they lose the ability to deny the authenticity of documents that might surface. Ambassador Tarasov's predecessor as U.N. Coordinator, Ambassador Yuli Vorontsov, for example, appears in a 2007 Wikileaks cable telling the U.S. Embassy in Kuwait that Kuwait remained "focused primarily on the return of missing Kuwaiti government archives" because the "Kuwaitis are nervous that sensitive government records may still emerge in Iraq with the potential to cause embarrassment to" Kuwait. Were I representing Iraq, I would try to use the continuing Security Council mandate as a sword in its negotiations with the U.S. State and Defense Departments over the return of Iraqi documents seized by U.S. forces, which have thus far been unsuccessful. 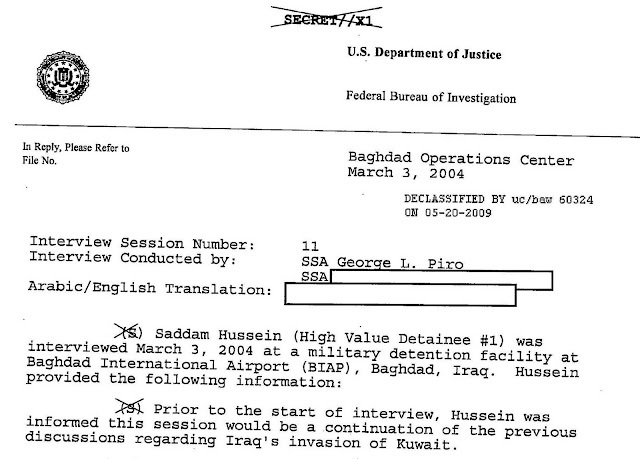 As I argue in the JURIST piece, the best place to locate new leads on the missing Kuwaiti archives has to be in the records of Saddam's government, a significant portion of which remain in exclusive U.S. custody. release to the GOK two boxes of Kuwaiti documents, ranging from UNCLASS to KUWAITI TOP SECRET, from the Combined Media Processing Center (CMPC) in Qatar. According to CMPC, all of the documents were gathered in Iraq during OIF and are from 1990 or before. (this situation was briefly described in this U.N. Secretary-General Report (para. 17)). Does this mean that the seized documents were thoroughly searched for any information about the Kuwaiti archives and these two boxes were the final result, or is this potentially the tip of the iceberg? Support for the latter possibility is that this was 2007 and as of 2006 less than 15% of the seized documents had been fully translated. In 2009, Secretary of State Clinton stated in a letter (Wikileaks version here) to the U.N. that "at this time we have no information" about the Kuwait archives which is something less than a representation that the U.S. had exhaustively searched the seized documents from Iraq. Also, even if they were thoroughly searched that doesn't necessarily mean the seized documents, when combined with other Saddam-era documents that remain in Iraq to provide relevant context, could not produce new information not apparent when the documents were examined independently. Iraq should also demand from the U.S. copies of any relevant interrogation reports of Ba'ath officials. 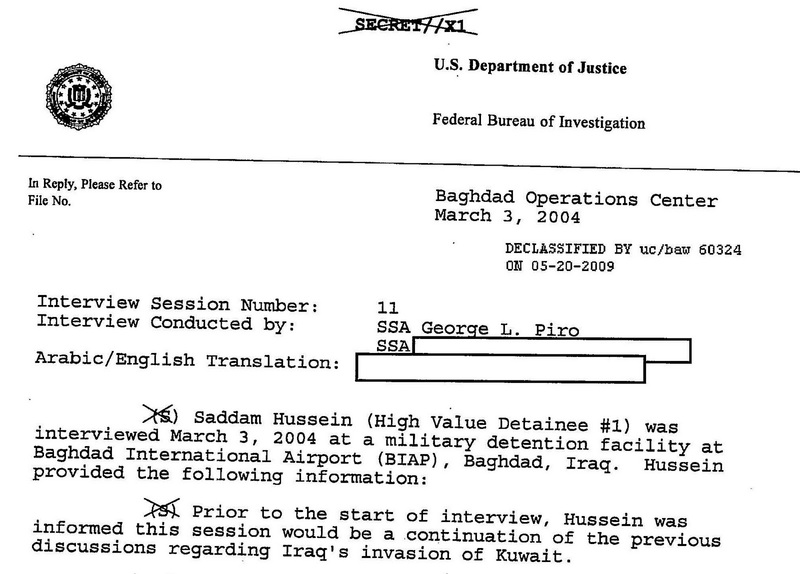 Saddam Hussein's FBI interviews, for example, are freely available here (I found only one reference to the seized Kuwaiti documents in an interview in which Saddam claims Iraq captured documents showing that Kuwait and the U.S. were in a "conspiracy" against him prior to his 1990 invasion). Note that in Wikileaks cables here and here the former U.N. high-level Coordinator, Ambassador Vorontsov, repeatedly requested that the U.S. interrogate detained former Ba'ath officials about the missing archives - he even provided names of specific individuals who might have had information. From Oct. 20-29, 2002, Iraq actually returned to Kuwait 425 boxes and 1,158 bags of documents or archives seized by Iraq. The handover is described in extensive detail in this U.N. Secretary General Report (esp. paras. 36-75). The exact content of these boxes and bags, however, were never independently verified. Iraq provided the U.N. with this letter that listed in the annex the documents it claimed it was returning. According to the U.N., Iraq also provided detailed packing lists to Kuwait. The questionable handover procedures, however, allowed neither U.N. nor Arab League representatives who were present to examine the documents. Therefore, what Saddam's Iraq handed over was essentially a black box (or rather 425 of them), the contents of which no one, other than Iraqi officials under Saddam Hussein and Kuwaiti officials, could possibly confirm. Kuwait later claimed, with precious little detail, that the returned documents were simply "routine papers" that could not be "regarded as the archives of the State," an arguably questionable assertion that the Security Council simply accepted without scrutiny on the basis that Kuwait was "uniquely positioned to ascertain whether Iraq had returned all the documents taken by Iraq, including the return of its national archives." Kuwait should be asked to provide the Iraqi packing lists as well as provide Ambassador Tarasov with access to the hundreds of boxes and bags worth of "routine papers" to allow verification. In short, all sides have repeatedly declared their support for the search for Kuwait's missing archives. In "intensifying" efforts to find them (as the Security Council demands), Iraq, Ambassador Tarasov, and the Security Council should make sure that the declared support from all possible sources is legitimately forthcoming.